I brought an Epson Movie Mate HD85 from the USA. I also brought a 6 foot by 10.5 foot screen from Carl's Place ( www.carofet.com ). I went to the hardware store and built a frame out of PVC pipe. A movie projector actually looks pretty good just on a wall. But this way I can move it to a place where I do not have a wall. I had it on the front gate and was playing playstation in the street. I also moved it under the carport the other night when it was raining on and off. Inside the house it looks pretty good on a wall. This screen is attached with bungees so it is pretty tight so there are not wrinkles. There are other ways and probably cheaper ways to to it but this works pretty well. In the USA I have used 1 inch EMT pipe for a larger screen that is free standing. The screen I have here is not free standing and the PVC pipe is much lighter. The guy at the hardware store even made all the cuts on the PVC pipe for me. I just painted a 9' diagonal 16:9 rectangle on a wall with flat white paint. Made an excellent projection surface. Been a while since I added pictures. Hopefully it uploads. A wall works great and is easy if it is in the correct location. 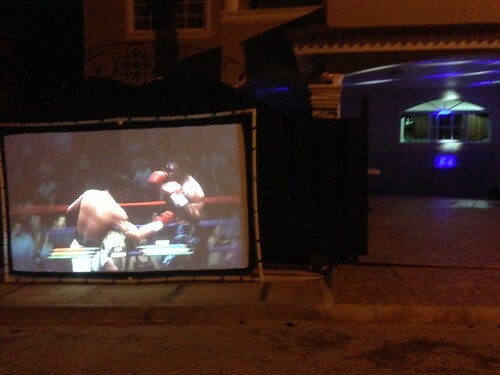 The projectors are getting better and cheaper so I would think more people would get them. Especially in the Dominican where you normally have great weather at night to use it.